The first generation Hyundai Veloster was an odd duck. Radical styling turned heads and introduced new buyers to the Hyundai brand, but its driving dynamics left a lot to be desired. Enthusiasts hoped the 201-horsepower Turbo model would perform as its bodywork suggested, but power and handling weren’t deserving of the “hot hatch” title. The 2019 Veloster N is the first U.S. and second global market vehicle from Hyundai’s N Performance brand. 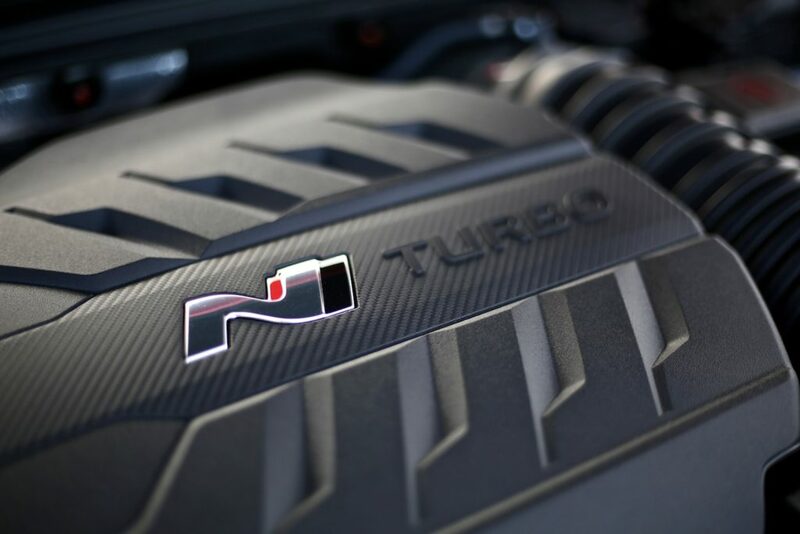 Modeled after in-house tuners like BMW M and Audi Sport, N Performance optimizes the driving dynamics of select Hyundai models far better than aftermarket bolt-ons. To prove it’s serious, Hyundai established an N technical center adjacent to the famed Nurburgring, where the best performance brands thrash and tune their cars daily. Built to compete with Volkswagen’s Golf GTI ($27,310), Ford’s Focus ST ($26,045), and Honda’s Civic Type R ($35,595), the Veloster N will start under $28K (official pricing is TBD) and offer two stages of tune. Our first drive of the Korean sports car takes us to Thunderhill Raceway in Willows, California. Additional welding to the doors, side sills, roof, and hatch, stiffer front strut mounts, and better bracing increase torsional rigidity by 6.9% over the Veloster. By switching from a column to rack-mounted power steering system, N Performance improves feedback.13-inch front and 11.8-inch rear rotors match with single-piston floating calipers for a significant brake upgrade. Hyundai says it chose not to add a Brembo brake package to keep up front and replacement costs down. Continuously variable suspension dampers with five G sensors optimize ride quality regardless of driving scenario. Three ESC modes and a brake-based torque-vectoring system stay one step ahead of understeer and wheel slip. Standard Michelin Pilot Super Sport tires provide consistent grip for all your track day exploits. All that’s just the standard performance kit. An optional performance package adds an electronic limited-slip differential, 19-inch wheels wrapped in specially developed Pirello P Zero tires, larger brakes, a variable exhaust system, and, most importantly, 25 additional horses from a re-tuned ECU (totaling 275hp). Our Thunderhill test mules are peak N Performance spec, including a set of dealer-option sport brake pads. 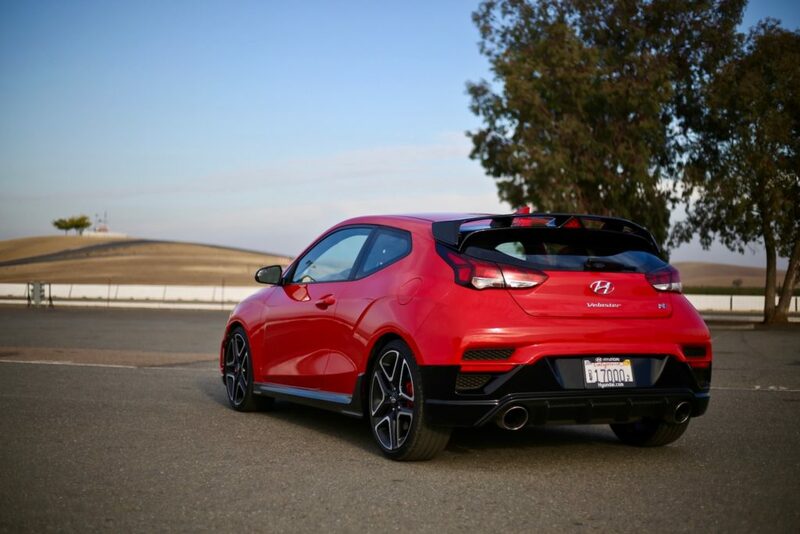 Among its front-drive foes, the Veloster N performance pack touts the second most horsepower (only the Type R’ 306hp trumps it) and lowest curb weight (just over 3,000 lbs). Combined fuel economy matches up against the Focus ST and Civic Type R, but is 3 mpg off the GTI’s 28-mpg figure. At a sub-$30K price including destination, the Veloster N performance pack slots neatly between the most affordable rival (Focus ST) and most expensive (Type R). With the 2019 Veloster N, Hyundai has added a critical pillar to its U.S. market appeal. Over the last two decades, the Korean automaker has improved vehicle quality and styling to compete directly with Japanese and American players. With the introduction of N Performance, the company can finally switch from defense to offense. 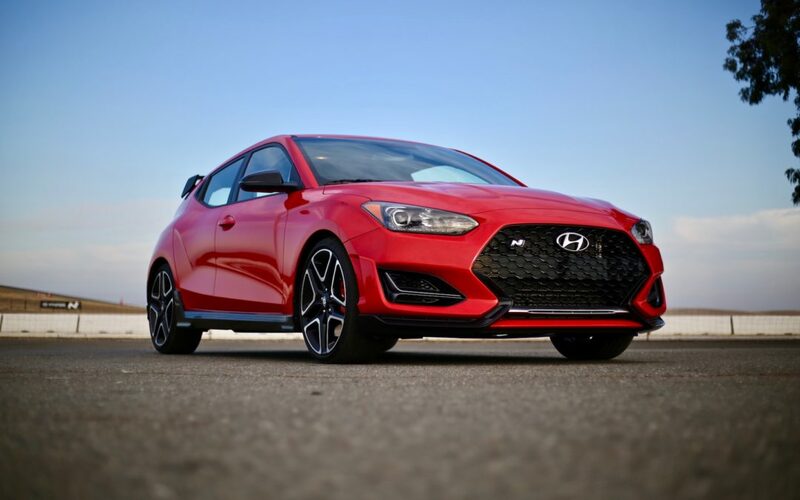 Compelling, attainable performance products like the Veloster N will re-shape young customer opinions (the most important demographic for mainstream brands) like never before. For our part, we can’t wait to sink our teeth into more N Performance goodness.